"I'm more convinced than ever that there isn't a better imager out there. To me that means one thing: that we've got the best." In the Caribbean region, there is no imaging conglomerate quite like Somascan. In fact, 30-year-old Somascan, which operates five imaging centers situated throughout San Juan, Puerto Rico, is the standard by which imaging practices in the Western Atlantic are measured. At its various centers, Somascan, which since 2004 has strengthened its fleet of high-end technology by installing four state-of-the-art Codonics Horizon® Multi-media Dry Imagers, has everything required of a top-flight center: the first 3-Tesla MRI system in the Caribbean, 1.0T open MRI, 64-slice CT, open MRI, PET/CT (at four centers),4-D ultrasound, and digital subtraction angiography. As if that weren't enough to rank it among the leaders, it recently installed the region's only cyclotron, which produces radiopharmaceuticals for PET and SPECT. Clearly, Somascan is a leader. Its imaging centers include Somascan Plaza, Somascan Hospital Oncologico, Somascan Hato Rey, Somascan Condado (where the 3T MRI system is installed) and Advanced Medical Care, a workman's compensation clinic. Credit Codonics with helping those centers to maintain that leadership position in an increasingly competitive region of the world. Somascan's relationship with Codonics began in 2004. The practice, which is staffed by seven full-time radiologists who complete more than 30,000 CT and MRI scans alone each year, had become increasingly dissatisfied with its five dry laser imagers, which frequently required servicing and were costing Somascan both time and money. "We were often having problems," said Frank Kolodziej, M.D., president of Somascan. "In particular, the imagers seemed to always be out of calibration. We're a very busy practice, and every time we had a problem it was very difficult on us. And, the downtime was costing us money." When a Codonics representative promised a far better solution, Dr. Kolodziej paid close attention. He watched the Horizon Ci in action and took note of the high-quality images it could quickly and flawlessly print onto film, color paper and grayscale paper. Still somewhat cautious, however, he agreed to install a Codonics Horizon Ci on a 30-day trial basis. Once he began printing images on his own, Dr. Kolodziej knew he wouldn't need 30 days. "The Codonics Horizon calibrates itself, which impressed us greatly," he said. "And, the quality of images it consistently produces is superb, with rich, full colors. Also impressive is its versatility. 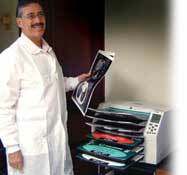 We can use film, grayscale and color paper, depending upon the type of media our referring physicians' prefer. Our other imagers certainly couldn't do that. "I knew at once I wouldn't need 30 days to decide that I definitely wanted to keep the system," he said. "It was beautiful." In fact, Dr. Kolodziej decided to purchase three more Horizon imagers, the most recent of which was installed in January 2006; he expects to soon purchase another one for the workman's compensation practice. In contrast to his previous imagers, the Horizon systems are workhorses. Codonics nonetheless maintains service capabilities a short distance from the San Juan centers in the unlikely event of a problem, another great benefit to Dr. Kolodziej. With the Horizon family of imagers, outstanding images are presented in a variety of sizes on clear and blue film, grayscale paper, and color paper. Horizon systems generate 14" x 17", 11" x 14" and 8" x 10" blue and clear film plus low-cost grayscale paper prints in 14" x 17", 11" x 14", A and A4 letter sizes, plus color in A and A4. The Horizon product line offers models designed to suit every need and budget, and each model can output to film, color paper and grayscale paper in a combination of sizes or types at the same time-completely automatically. Specifically, Somascan uses DirectVista® Blue Film (14" x 17") and A-size ChromaVista® Paper at the four general imaging sites; 14" x 17" DirectVista Grayscale Paper at most sites; plus ChromaVista Color Paper at Somascan Hato Rey. "The ability to print onto color and grayscale paper is critical to us," Dr. Kolodziej said. "Most physician practices in San Juan don't have a means of viewing films-doctors must hold the film up to a ceiling light in order to visualize it. Once we began sending them images on paper, they accepted it exceedingly well. They really like that." In fact, during the 30-day trial Dr. Kolodziej received positive feedback from several physicians. While the high-quality images he was outputting to various media had convinced him to embrace the system, the input he was receiving from referring physicians reinforced that decision. So did Codonics' reputation for customer satisfaction. "We received enough feedback from doctors to help us make an informed decision," he said, adding, "The system takes care of itself. Even so, knowing that if I had a question I could call Codonics and get an answer right away made all the difference in the world." In addition to the high-quality images that Horizon effortlessly produces, and its worry-free performance day in and day out, Dr. Kolodziej has been especially impressed with its ability to print onto grayscale paper. In fact, Somascan centers have cut their media costs by 40% to 50%, thanks largely to their ability to print onto lowcost grayscale paper. The company's savings through the end of 2005 totaled a whopping $125,000. However, that's not the whole story. "At the Condato office, we knew of one physician who had a view box in his office and who still preferred to work with film," he said. "So for him we switch over to film, and that makes him happy. That's where versatility makes a difference." Images for orthopedic cases also may be printed onto film for viewing in a surgical suite, where there usually is a view box. However, most referrers prefer to receive diagnostic-quality images on grayscale paper. According to Dr. Kolodziej, the images that Horizon produces look so good that a marketing use has emerged. " We tend to print the best ones out to show people,sort of like you'd show off a Rembrandt," he said, adding that Somascan plans to upload several images onto its web site. "We have many beautiful cases, and we can print them all out because it's affordable to do so," he said. These days, Somascan centers often print onto film for neurosurgeons and orthopedists. Color paper is useful in demonstrating blood flow in cardiac studies. However, 75% of images are printed onto grayscale paper. In Dr. Kolodziej's mind, the best images are derived from chest x-rays printed onto film. Its clinical capabilities aside, Horizon has proved beneficial in other ways. It fits on a desktop, weighs less than 70 lbs., offers the fastest time-to-first print, and is the only imager that delivers diagnostic film, color paper, and grayscale paper from the same device. "The images are terrific, the training we received from Codonics was excellent, the support is outstanding, the system was inexpensive to purchase and operate, and it doesn't take up much space," Dr. Kolodziej said. "I'm more convinced than ever that there isn't a better imager out there. To me that means one thing: that we've got the best."